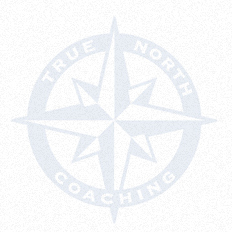 True North Coaching | Living Proof... you can survive cancer! Living Proof... you can survive cancer! In the depths of winter I found within me an invincible summer. My experience with cancer was like taking a deep breath, diving into the deep end of a pool and hoping I'd be able to make it to the other side before having to take a breath. As a young adult, just as I was defining who I was and where I was going, testing my wings and enjoying the freedoms and responsibilities of adulthood, I was thrust back into childhood dependence where all the rules had changed and no one told me there was going to be a test. As a young adult, barely 19, I was striving for my independence. I had my own car, held down four jobs so I could pay for my own education the following year and I found myself my own doctor. I didn't really like her but she was mine and autonomy was the important thing. I remember telling her I had a lump in my neck and being told it was nothing to worry about. Persistently, I went back when a second and third lump appeared and was dismissed each time. After repeated colds I was sent for a chest X-ray to rule out pneumonia which came back clear of any abnormalities. One Friday at work I was called by my doctor's office and told I had an appointment that day with an oncologist—what was that? After work I headed off to the hospital, waited alone on a bed behind a curtain for an hour, where after examination and an X-ray I was told I probably had Hodgkin's Lymphoma and could I come in for a biopsy on Monday. The original X-ray had been misread and I had 12-15 tumors in my neck and one the size of a baseball in my chest. Driving home I remember thinking, how do I tell my parents? As a parent myself now I cannot imagine the shock and fear upon hearing that your child has cancer. The biopsy showed malignancy and I was scheduled for a staging laparotomy a few weeks later. Then the roller coaster of tests and procedures began: endless blood tests, bone marrow biopsies, liver biopsy, ECG's, lymphangiograms, body casting for radiation, mouth guards made for fluoride, multiple vaccinations, X-rays, tattooing for radiation, breast exams, pelvic exams and the hours upon hours in waiting rooms. When most people hear the word cancer they think death. When I hear the word cancer I know that the battle over despair can be just as hard. Lying in the dark, unable to sleep despair speaks: who will want to marry me now that I have had cancer, they will be afraid I will die, what if I cannot have children now and what if I don't make it? Despair kills hope. The fight over despair is just as challenging as the fight over disease. Cancer taught me about hope. Hope is not a positive mental attitude. I had hope but I was not always positive. I remember people saying to me, " If you're gonna get cancer, Hodgkin's is the best one to get. The cure rate is 80% for 5 years!" On those hopeful but not so positive days I would quip back, "Yeah, and if there is a 20% off sale at The Bay you think it is a good deal!" The night before the staging laparotomy to determine the exact extent of the cancer I remember everyone had gone home and I was alone in Lions Gate Hospital. The walls were green, the curtain was green, the sheets were green... even my hospital gown was green. I remember lying there very aware that I was probably not going to die from the cancer but I could very well die from the surgery as mistakes can happen to anyone and they had already happened to me. I remember thinking about death and thinking very methodically about what that meant. Now that something bad had happened would the faith I had in God really sustain me or had it all just been some nice people with moral ideas? Would heaven be like what I had been taught? Was there really a God who would take me up in his arms and hold me in his lap? As I lay there I decided that yes was really the only answer to these questions. At that moment as I solidified my belief I was overwhelmed with excitement of the reality of what I believed and where I would be going... and possibly very soon! It was as if God was giving me a glimpse of heaven. So here I was, a young girl who sought God's answers and, instead, got God. I do not know how long this experience lasted but to this day I feel like I have had a tangible experience of heaven and no matter how good life gets for me I am aware of my longing for heaven and when I struggle in life there is no better place than curling up in the lap of God. Though I walk through the valley of the shadow of death, I will fear no evil, for you are with me. One of the hardest things about having cancer is battling the 'shoulds'. "You should be thankful that the doctor even has time to see you today and waiting an extra 2 hours is nothing to see the doctor who is saving your life." "You should be happy they didn't find any cancer in your abdomen and the scar isn't really that big anyway...and who needs an intact bellybutton." "You should be strong and not cry because it will just make it harder on everyone else and you have already made things pretty bad for them already." I remember after 6 or 7 days of being at Lions Gate hospital after my surgery and a lovely older woman appeared at my door; a candy striper. She was to give me a sponge bath. I was still unable to properly get out of bed let alone take a bath. I remember the soft touch of her hands felt like a healing balm to my body. Her ancient voice reminded me of the kindness of my grandmother and I remember the quiet and the refreshing sound of water drowned out the incessant hospital noises. I asked for her the next day but no-one could place her. I have decided she was an angel. And whether she was or not she was sent to me by God for that moment. There are plenty of well meaning people who want to help you when you have cancer, but you have to be careful. Sometimes in an effort to be upbeat and optimistic people can tend to downplay the cancer experience. Many just want to help minimize your loss—they'll say things like, "Hair grows back," or "it's just something you have to go through," or 'I'm sure God has a wonderful purpose for allowing you to go through this." The impact of this kind of support has the experience minimized for the person who already feels guilty that are a burden. Family and friends who use an overly optimistic approach can shut down the expression of any negative feelings. The truth is people who want to minimize your pain just want to minimize their own. There are no appropriate clichés about cancer any more than there are shortcuts through suffering. The wisest of my comforters came and sat with me. One of the procedures done in preparation for radiation is to measure the curvatures and breadth of the area to be radiated to create steel blocks to prevent the radiation from penetrating areas that need to be protected like the heart, lungs and spine. The doctors and nurses meticulously map their targets and tattoo precision markers on your skin. As I lay there with nothing on I remember just keeping my eyes on the ceiling counting the seconds until it was over. Then the door swung open and a team of residents were paraded in. I was now the involuntary specimen of the day. STOP! I wanted to scream! There is a person here! Does anybody actually see the girl who is here or just another cancer patient to use for a school project? As a silent tear rolled down my cheek. A nurse noticed and asked if I was alright. My response was a stoic, "I'm fine" hoping desperately she would see my need, cover me up and tell everyone to leave. I literally wished I was bleeding so there would be something to show what was going on inside me. As a young adult I did not have enough experience in the big world to know I could say NO... I was a child in a grown up world. The course of treatment for Stage 2B Hodgkins Lymphoma in 1987 was 5 weeks of radiation. I was told I would probably begin to feel the effects after about 3 weeks so when I started to feel a tightness in my chest, heartburn and fatigue after only three days I was confused. What made radiation so difficult was that after every treatment I felt worse. So as my friends headed back to university I headed back to bed. The nausea and vomiting overtook me and after going from 135 lbs to 107 lbs since my diagnosis it was time for the heavy weight of prescription anti-nausea drugs—marijuana. At $16 a pill it numbed the nausea and allowed me to sleep and eat babyfood which was the only thing that could pass over the radiation sores in my mouth. I lost my sense of taste, lost my saliva and I lost my hair. The mind numbing fatigue kept me in bed most of the day unable to read or even watch TV. Even the calming effects of music lost its appeal. The heartburn was unremitting and the radiation burn that covered portions of my upper body was thick and tough. I was at the end of myself. I remember sitting in my parent's bed when I hit the wall. I had only a few days left of radiation and I remember feeling an overwhelming rise of emotion and thinking, "I can't do this... if I let go I will come completely unglued". I wasn't confident that I could ever be reassembled. I had never been to the end of myself before and I was afraid. I asked my oncologist if we really had to do the last 3 treatments (which were to be double up treatments) and he said it was necessary to have the best chance that the cancer did not return. I remember thinking, "I don't care... 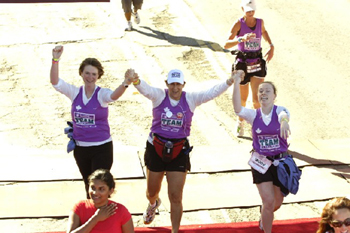 I would rather do all of this again than have to do three more increasingly harder days." Having friends and family who take you to medical appointments and help you throw up for the hundredth time are needed and gratefully appreciated and finding a soul who can meet you in the middle of your pain are two different things. And when you have cancer you quickly learn the difference. It matters terribly who is in your corner. Cancer is a frightening and lonely experience even with the best people in your corner... you still have to do it alone. Even when the flowers arrive, people visit and the church is praying you are still the one who has to undress and lie alone on the radiation table. My experience was that there was lots of talk about my body and disease but not a lot of talk about my mind, my feelings or my spirit. I do, however, want to recognize that people may have tried to press into these issues with me. What needs to be acknowledged is that in the middle of crisis just asking, "So how are you feeling?" will only get a protected response. I remember being out to convince everyone that I was fine and that nobody needed to worry about me. It was not only difficult but practically impossible to maintain emotional authenticity... it was all about coping and making it through. As a young adult I needed people who were trained in the socio-developmental stage I was in , knowing the issues I was facing and had the skill and gift of how to connect with me and create a safe place for me to open up. As I look at my children I want to believe that I can provide everything that they need. I want to protect them, love them and be there for them in whatever circumstance they need. One of the hardest things for me to accept would be that something or someone else could offer them something that I could not. This is what I needed. I remember being offered a visit with a social worker but declined feeling like I had the support of family , friends and church. What a mistake. I did have all of that and more was needed. Life is a series of losses. For me cancer illuminates this statement. Loss is an inevitable part of living. And though I didn't lose a breast or a limb. Cancer has sustaining losses. As a young adult the loss of dignity is excruciating. As a modest young woman the prying questions and the necessary procedures routinely done at the hospital subjected me to multiple experiences where the proper care of respecting the dignity of a young woman were too often neglected. The word lost, like the word love, has been robbed of its deepest meaning. Real loss is not small or inconsequential; it is personal and irretrievable. It changes your life forever. Hearing the words, "You are in remission" I would like to say flooded relief over me like a cool shower on a sunny day. 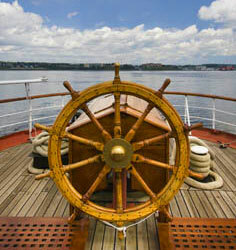 As I saw the smiles of my oncologist and family I remember my confusion. I remember thinking, "Isn't this what's supposed to happen?" Though I had fun planning my funeral and making cancer jokes throughout there was still a part of me that never fully connected to the seriousness of it all. After cancer my world was suddenly divided into 'before' and 'after'. Before was when I dreamed with optimism and idealism and convinced that through my own effort I could be and have and do anything I wanted. Before was when I was in control of my body: who saw it, who touched it and trusting it to do its job. Before was knowing I would die one day but it was Friday night and I had plans! Cancer in many ways was the dividing line between childhood and adulthood. After was when I wondered if I would be able to have children and the fear that the loss of motherhood would devastate me permanently. After was when every normal lump, freckle and cough was often enough to warrant a trip to the doctor... just to be sure. After was when I was so deep in denial about the seriousness of my own experience that upon hearing of the diagnosis a of another I would coldly declare, "Oh I am sure they will be fine." The single most helpful thing I found was connecting with someone else who 'got it'. On the day I was declared in remission there was a 16 year old girl in the waiting room who also received the same news that day. We exchanged phone numbers and met several times at the White Spot for a meal and talked cancer. This was my first experience of cancer conversation where I could be real knowing I did not have to protect her from the intensity of my feelings or the gory details cause she could usually match me! One of the hardest things about my cancer experience was being well following the illness. The once concerned looks from across the room and compassionate questions regarding my wellbeing stopped. Now who was I? I had lost my way. It was difficult to reconcile what happened when everyone wanted to get back to normal including myself. I jumped back into work, reveled in the freedom from doctor's waiting rooms, the smell of the cancer agency and the fear of being told I was scheduled for some medical procedure that guaranteed pain and the unknown. I had a confusing push pull, though, of wanting to tell everyone what I had been through and denial that it had happened at all... desperate for attention and feeling guilty for seeking attention. Getting back to normal does not mean ignoring what happened, however, a new normal needs to be established where the experience is honoured and the future embraced. Over time I have found my way again. I had cancer but cancer did not have me. Some things took longer than others and life is a journey not always about finding the answers but exploring the mystery: the mystery of life, God, relationships, feelings and experiences. The cancer thief had stolen my sense of direction but the disease did not get the good stuff. All the me-ness that makes me was still there. The me that snorts when I laugh too hard, the me that loves driving to loud music on a sunny day, the me that loves to cry at a sad movie and the me that believes there is no better place than sitting in the lap of God. Many people have asked me how cancer has changed my life. I never know how to answer that question because I don't know what my life would have looked like if I hadn't had cancer. But I do know what cancer has grown in me. You see, cancer does not just grow malignancies. It also grows faith. It grows courage. It grows strength. It grows tenacity. It grows gratitude. And all of these things I have needed in my life after cancer. 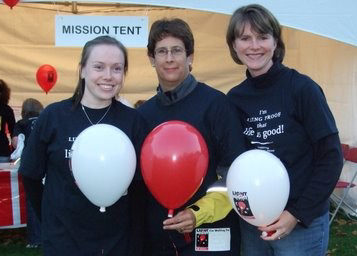 Many cancer survivors speak about their cancer as being a gift. To me it was never gift. If it was where can I take it back! However, faith, courage, strength, tenacity, gratitude. I'll take those! I'll even pay full price... and I did. As I have struggled with depression, infertility, pregnancy losses, relationships, parenting and career I have leaned into all of these... and I am grateful. Many people said I was strong—I heard that all the time. But really what choice do you have? You get cancer—you deal with it. The thing I am so amazed at is the resilience of the human spirit in the face of adversity. Sometimes you have to dig deep for it but it is there. 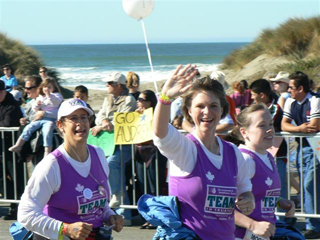 In October 2007, my friends Margaret Evans and Carolyn Roper and I ran (and walked a bit) the Nike Women’s Half Marathon in San Francisco and we raised almost $30,000 towards our goal of creating better patient care for young adults facing cancer. Twenty years of cancer survivorship feels pretty good! !